Joyent is both a customer of GoInstant and GoInstant is a customer of Joyent’s. I’ll avoid all the back patting, but we picked Joyent because we needed rock solid infrastructure and AWS wasn’t cutting it for the sort of compute/serving we do. We’ve been extremely happy there. So when the folks at Joyent asked if we were interested in contributing a guest post on their blog, we jumped at the chance. We also took it as an opportunity to start a conversation about the Shared Web. You can read the entire post over on the Joyent Blog: GoInstant and The Dawn of the Completely Shared Web. The web is always evolving. As the underlying technology of the web has advanced, we have been able to use the Internet in more creative and interesting ways. We have gone from documents filled with static content to a web of applications, each providing different types of experiences, data and information. We have gone from static shopping cart structures to useful collaborative filtering shopping suggestions to social shopping. We have gone from downloading movies and videos to sharing movies and videos with friends. In the past year or two, we have entered a new and incredibly exciting phase of the web – The Shared Web.A few years ago, the idea of a 100% shared Internet seemed impossible. The connections were too sluggish and unreliable – in particular on the mobile side. The Web application frameworks did not do very well with situations where extremely low latency was required to keep users happy. But new technology and changes to the core of the Internet are making a lightning fast Shared Web possible. 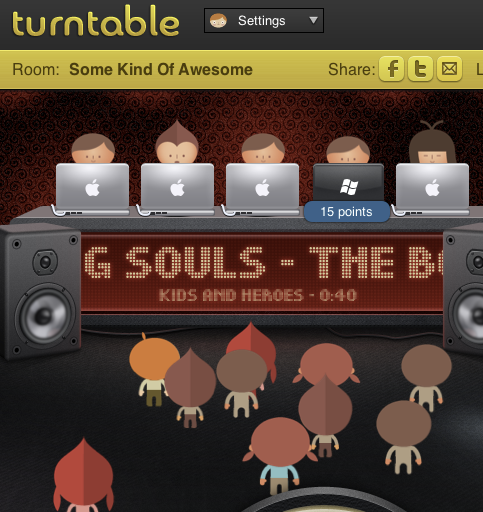 I spent most of the evening hanging out on turntable.fm tonight. It makes the music sharing experience incredibly intimate. Then I started staring at Facebook. I can’t shake the sense that there is so much presence on the site, it is obvious that people are there, but there is no intimacy. We come to Facebook today to transact in information. We do not share, instead we distribute. Intimacy on the web means that we are aware of the presence of others with us at that place and time and that we can benefit from that real-time presence in a unique way. Our lives are so slowly becoming digital. The transition is one that takes decades, not years. The thing I hadn’t realized until recently was that I was mistaking the cataloging of my life online for the living of it. It’s the leap that World of Warcraft made in gaming and I’m positive that it is coming to the web sometime very soon. 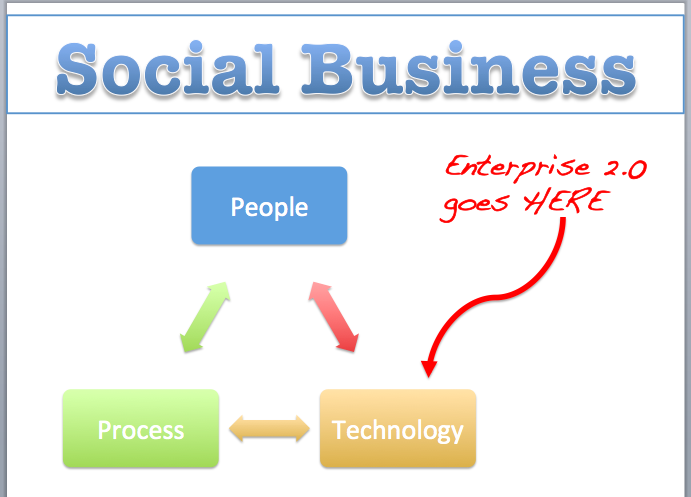 I thought I would make a helpful slide for the next time an “Enterprise 2.0” vs “Social Business” debate comes up. Feel free to click to get the full sized detailed view. I made it as pretty as I could. E20 and Social Business each both need the other. 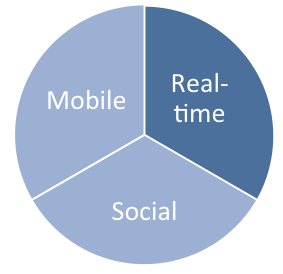 The more that IT can focus on becoming more comptent in rapidly testing, deploying and monitoring E20 applications in the enterprise, the faster and more effectively Social Business will be a reality. I have created a short questionnaire that I am sending out to people who have built or are building enterprise focused software startups. This is not a formal survey, and I am not doing it for commercial purposes. 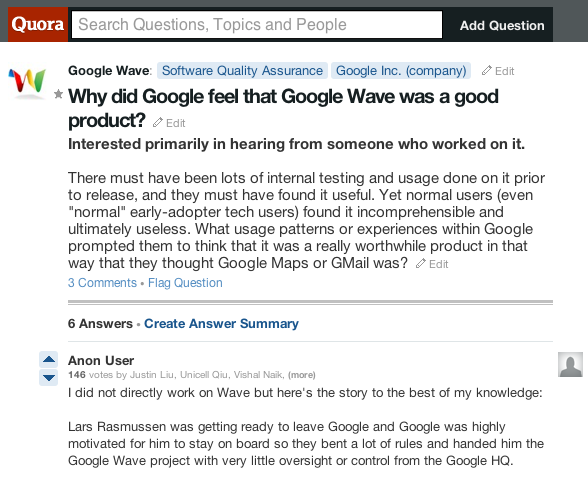 What I want to do is collect the insights, advice and experience of people who have been-there-done-that, or who are in the thick of it right now.